When it comes to looking for originality and wit in the works of contemporary American playwrights, you can always count on David Lindsay-Abaire to deliver the goods. Theatres throughout the U.S.A. regularly commission new plays by him; he’s provided his audiences with a series of remarkable plays which successfully straddle the line between comedy and serious drama, among them The Devil Inside (1997), Snow Angel (1999), Wonder of the World (2000), Kimberly Akimbo (2000), Fuddy Meers (which Wig & Buckle staged three years ago ), and the work we’re presenting tonight, his 2006 drama Rabbit Hole. 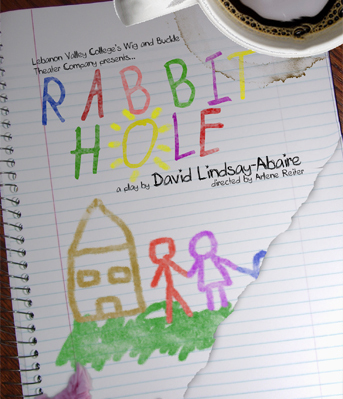 Originally commissioned for the South Coast Repertory of Costa Mesa, CA., one of the nation’s most active hothouses for new dramas, Rabbit Hole had its world premiere on Broadway at the Biltmore theatre in January 2006. Starring Cynthia Nixon and John Slattery as Becca and Howie, two parents who have lost their four-year old son in a street accident, Mary Catherine Garrison as Becca’s troublesome sister Izzy, the redoubtable Tyne Daly as Becca’s odd mother, and John Gallagher Jr. as Jason, the teenage driver responsible for the child’s death, the show dazzled critics and won the 2007 Pulitzer Prize for Drama. The show has become a great favorite with actors across the nation for its intense conflicts, its actor-friendly dialogue, and the challenging emotional arcs of its characters. About Rabbit Hole the author has written that its characters are not paralyzed by their grief but “are, instead, highly functional, unsentimental, spirited, and often funny people wh o are trying to maneuver their way through their grief and around each other as best they can.” Anyone who is experiencing the grieving process or has survived it will recognize the behaviors and language Becca, Howie, and the other characters of this play employ to get through their loss, and also will hear in the play Lindsay-Abaire’s challenge to the popular culture’s notions of an ideal “perfect healing” and the illusory promises of “closure” promoted by talk-show psychologists, group therapy junkies, and contemporary religious triumphalism. The parents of the show are bombarded by advice on how they should be grieving; it is Becca and Howie’s tragedy that despite all the cultural expectations acting upon them, they can’t even find a common methodology of grief they both can share. 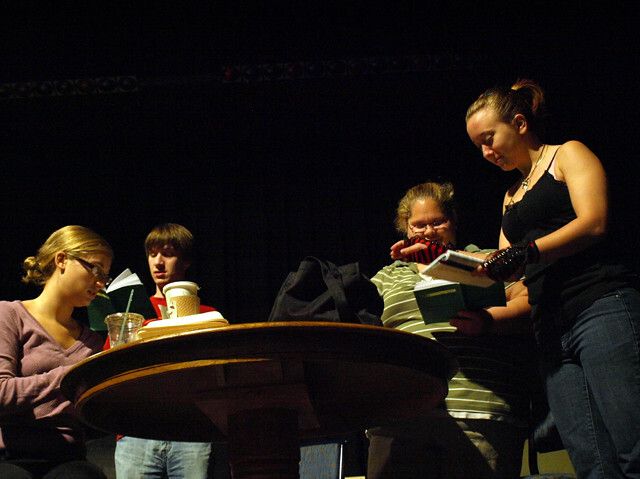 It is their painful and often funny attempts to reorganize their shattered life together and find their ways through the wreckage that David Lindsay-Abaire, one of our master dramatists, wants us to concentrate upon—the struggle, not its resolution. Loss produces scarring, memories replace the lost, and we should realize that the thing we ought to concentrate our admiration upon is the persistence and endurance of those who mourn, not the nebulous theories of how to mourn correctly.